When we decided to begin accepting select advertising last month, we specifically wanted to showcase home businesses with products that might appeal to our rural- or preparedness-oriented readers. No more big mega-companies (with the exception of Tattler reusable canning lids). We wanted to profile folks whose creativity and ingenuity are allowing them to make a living using their hands and their brains. Here’s a perfect example: we’re pleased to welcome our newest advertisers, Judith and Mike Ozmer of FarmWife Products, purveyors of wondrously hand-crafted soaps. And when I say hand-crafted, I don’t mean they just mix the ingredients – I mean they obtain local organic grass-fed beef tallow, render it themselves, and go from there. Wow. 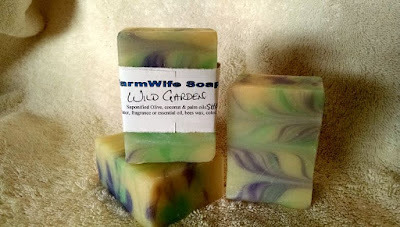 FarmWife Soaps was born after the Ozmer’s favorite source of homemade soap dried up. Wanting to continue using a natural product, Judith decided to learn how to make creamy high-lather soaps herself, and the rest is history. FarmWife Soaps come in a variety of fragrances, including Forest Camo (inspired by our dear friends Paratus Familia), lemon, orange cream, and other delectable scents. They deliberately package their soap in “cheap little paper” to keep costs low (after all, they remind us, they’re selling soap, not fancy packaging). Right now, as an introductory offer, FarmWife Products is having a special: buy six bars and get free shipping. FarmWife Products also sells ethereal hand-spun wool items – once again, crafted from beginning to end, from sheep to final product. They’re also offering free shipping with the purchase of any wool item. If you read the About page on the Ozmers, you’ll quickly see these folks are hard-working, resourceful, flexible, and talented – in short, they epitomize the can-do entrepreneurial spirit of Rural Revolution readers, which is why I’m so pleased to showcase their products. I can not get to their site through your page. I went to before it's news and got to your page and then to their site but could not get anything into the cart. Can you offer any help? The links seem to work fine and we just placed an order successfully. Perhaps you could make sure your scripts are not blocked or something? I'm sorry I can't be of more assistance. This morning it worked so I ordered some soap. They were out of the cammo though, and I really wanted to try that. Thanks to you and Farm wife prod.